July 10, 2012.- The electricity demand in the first half of 2012 increased in most of the Western European countries due to the cold snap that hit the continent in February. However, the demand in Spain and Italy in this first half of the year has been lower than the demand registered in the same half of the past year as a consequence of the economic crisis experienced by these countries. 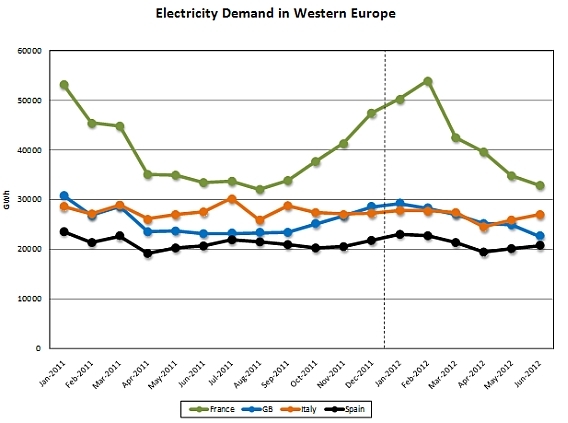 Monthly evolution of the electricity demand in Western Europe -2011 and the first half of 2012- in GWh. Source of data: France – RTE, Great Britain (GB) – National Grid, Italy – TERNA, Spain – REE. In Spain, the electricity demand in the first half of 2012 has been 0.3% lower than in the same half of 2011. However, in the second quarter of 2012, the demand has increased 0.2% in comparison to the same quarter of the past year. On the other hand, the Spanish economic activity shrunk 0.4% in the first quarter of this year. In France, the electricity demand in the first half of 2012 has been 2.8% higher than the demand registered in the same half of 2011. Moreover, in the second quarter of 2012 the demand has increased 3.7% in comparison to the same quarter of the past year, which is in accordance with the fact that the French economy grew by 0.4% in the first quarter of 2012. In Great Britain, the first half of 2011 closed with a 0.4% increase in the electricity demand when compared to the demand registered in the same half of the past year. When analyzing the demand’s behaviour in the second quarter of 2012, we come to the conclusion that it has increased in 3.3% with respect to the same quarter of the year 2011. The GDP in the United Kingdom did not vary on a year-on-year basis in the first quarter of this year. The electricity demand in Italy in the first half of 2012 dropped by 2.9% with respect to the same half of the past year, and it also dropped 4% in the second quarter of 2012. This could be due to the fact that the Italian economy shrunk 1.3% in the first quarter of this year. 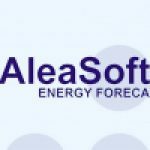 AleaSoft predicts an increase of the electricity demand in France and Great Britain for the year 2012. On the other hand, it expects a drop in consumption of electricity in Spain and Italy with respect to last year. The electricity demand in Spain in the second half of 2012 is also expected to drop in 1.7% with respect to the same half of the past year. 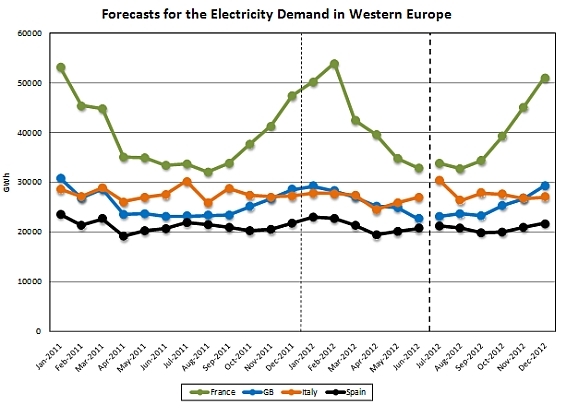 Consequently, the forecast of the demand for Spanish power at year-end is 1% lower than in the year 2011. These forecasts have been made using a GDP growth for the year 2012 of -1.8%. The electricity demand in France in the second half of the year 2012 is expected to be 4.8% higher than the demand registered in the same half of the year 2011, thus closing the year with a 3.7% increase in annual demand. The forecast for the demand in France has been carried out using a GDP growth for the year 2012 of 0.4%. In Great Britain, the electricity demand in the second half of 2012 is expected to increase in 0.8% with respect to the same half of the past year, and the annual demand in Great Britain is expected to grow by 0.6%. These forecasts have been made using a GDP growth of 0.5% for the year 2012. In Italy, the electricity demand in the second half of 2012 is expected to shrink 0.5% with respect to the same half of the past year. Consequently, the annual electricity demand in Italy at year-end is expected to be 1.7% lower than in the year 2011. The GDP used for this forecast suggests that the Italian economy will suffer a 1.7% shrink in the year 2012.